Local food growers, consumers and entrepreneurs in the Lansing, Michigan area have had good cause to celebrate as of late. Last September, Allen Neighborhood Center, a community development agency that doubles as Mid-Michigan’s nonprofit food hub, opened the doors of a warehouse they’d spent months renovating. 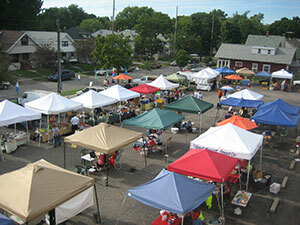 Located directly behind their community center on the city’s northeast side, that building, the Allen Market Place, now serves as an incubator kitchen and indoor market. It’s also linked to an online market called the Exchange, that connects regional farmers and food producers with commercial and institutional buyers in a 75-mile range of Lansing. The AMP is the crown jewel of a series of food-oriented programs the Allen Neighborhood Center has been developing for about a dozen years. These include a food pantry, an outdoor market that runs from May through October; an organic greenhouse based in a local park that’s home to various urban gardening activities and workshops and a year-round CSA. Just how the AMP got built is very much tied to its parent organization’s location and mission. Although the Allen Neighborhood Center has been working with other entities for nearly a dozen years to strengthen the regional food system, ultimately it’s a place-based organization, serving about 8,500 households in the northeast quadrant of Lansing. The organization is run by a board where at least half the members live in the surrounding neighborhood, actively reaching out to community members to identify neighborhood needs and guide initiatives. Local residents are engaged through regular meetings at local cafes. Early on, the nonprofit decided to take on food issues when it became apparent that access to healthy affordable meals was an overwhelming issue in its neighborhood; 20 percent of residents had no motor vehicle and were shopping at a local liquor store for groceries. The recognition of this need led the establishment of the Allen Street Farmers’ Market in 2004. After ten years of the seasonal farmers’ market, neighbors were hungry for an indoor winter market where they could shop during the colder months. Meanwhile, the neighborhood center had been renting out local kitchen space for nutritional and culinary job skill workshops and having conversations with local growers about how a food hub could help increase the economic viability of the local food scene and increase food security. Funding came from a combination of local community and family foundations, city and state grants and individual contributors. Neighborhood volunteers helped with renovations, and the project received special deals from local building trades workers. The 5,200-square-foot building now features room for vendors as well as a full kitchen with three-bay and two-bay sinks, an ice maker, two large coolers, counter space and dry storage. The AMP also provides workshops on business development, food safety and other topics. Businesses now using the kitchen include Red’s Smokehouse, a barbeque operation that eventually hopes to set up its own brick-and-mortar restaurant; American Delicacy, a mushroom-foraging outfit; and a small grocer that makes grab-and-go food for customers there. The AMP is in the process of setting up a fermentation room for a microbrewery. Fees for the kitchen range from $12-$24/hour depending on a number of factors. Rates increase over time as renters increase capacity. While this popularity has surprised Nelson a little bit, she happily confides it’s what they’ve strive for as an organization.